There’s nothing more frustrating than having this great block of uninterrupted time, opening your bag, and finding that you didn’t pack the documents you need. Or your computer battery is dead. Or your thumb drive is missing. Create a checklist to adequately prepare for each and every trip. Do not waste time and mental energy trying to remember everything you should do or pack before leaving. Use your previous travel experiences to guarantee that nothing is forgotten and you’re fully prepared for your trip. Add any missed items to your digital master checklist so they will not be overlooked the next time you travel. Before leaving for your trip, back up all of your electronic files and make them accessible in the Cloud. If for any reason your laptop gets lost, stolen or broken you will be able to continue your work by accessing your documents via the online storage app. When you are on a business trip you are generally in longer meetings than usual and unavailable for extended periods of time. Set reasonable expectations by communicating to others that you are away on a business trip. You can easily achieve this by updating your voicemail greeting and setting up an auto-responder email. State the dates you will not be available and inform them you will return their call or email as soon as you can which will put them at ease knowing you are not missing in action or avoiding them. Always ask yourself what the best use of your time is and plan accordingly. As tasks get added to your task list think about when and where is the best time to accomplish them to be most efficient and effective. For example, the plane is one of the best places to get uninterrupted, focused work done. There are no phone calls to take, emails begging to be answered, or co-workers walking by your desk. The time you spend in the airport waiting for your flight to board may be the best time to respond to emails that require less focused attention. Create your plan of attack to complete tasks instead of losing yourself in a fashion magazine or social media app and stick to it! Arrive early to the airport, to your gate, and to your destination so you can relax and work instead of stress about being late and potentially missing your plane. Take the time you gained from arriving early to find a quiet place to get 30-45 minutes of focused work completed. Whenever possible, fly to your destination well ahead of your first scheduled meeting. Don’t expect to fly in and head straight to your meeting. You’d just be inviting a delayed flight to ruin your day. Allow yourself time to settle in to your room and reenergize before diving into the work you came there to do. While traveling you generally have four different offices: the airport, the plane, your hotel room, and the host office. In each of these locations, create an environment that supports your productivity. Everyone is unique in how they work best. Some require noise to work in their zone of focus while others need absolute silence. Find what works best for you and strive to create that environment in each of your “offices.” That could mean using ear plugs or headphones with your iPod, and parking yourself next to a bustling aisle or tucked away in an isolated corner. Converting time will only confuse your mind and body. Once you board the plane, forget about what time it is in your city of residence. Once you land, reset your watch to the current local time if you have one and don’t look back. Your phone and laptop should automatically reset once online. This may mean going to bed at 11pm EST when it is only 8pm PST where you live. That’s ok. Ensure you get to bed early enough so you can get a full night of sleep which is 7 to 8 hours for most people. Taking care of yourself while traveling is important to your personal productivity but we often overlook self-care while away from home. Ensure you are drinking plenty of water and keeping yourself hydrated. Pack healthy snacks that provide energy for your jet-lagged body. This will save you time, money, and the temptation to consume food that fails to fuel your body. Squeeze in exercise when you can. Many hotels include a gym or can recommend one nearby that offers day passes. Taking walks or pushing yourself to do squats, sit-ups, jumping jacks, and other independent activities in your hotel room can also help you meet your exercise needs while on the road. This tip goes a long way in improving your productivity with little effort because doing so directly affects your energy level. Because you’re outside your normal routine, you may attempt to be productive while traveling by trying to get something done every spare moment you get. This creates a bad habit that can only wear you down. Despite your motivation to accomplish as much as possible, make sure to give yourself short breaks so you can reenergize, refuel, and refocus upon returning to your work. No one returns from a business trip looking forward to opening a wallet full of crumpled receipts with smudged ink and the tedious task of processing expenses. What should be a quick and easy task becomes a time-sucking project if you disregard receipts until you return home. That is especially the case when you’re already facing the challenge of returning to your normal work and possibly a different time zone. Streamline the task by using an app on your phone to process your expenses as they accrue. Time back in the office is better spent on high-priority activities that require your focus. 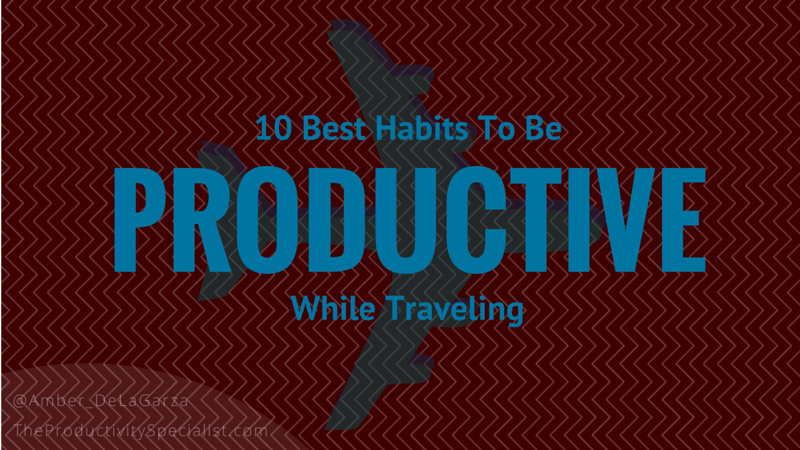 A good rule of thumb for being productive while traveling is to be flexible, but not with your good work habits. Those should be written in stone and abided by no matter what obstacles fall into your path. Flights get delayed, even canceled, drivers don’t show up, meetings run longer than planned, hotel representatives misplace reservations, and so on. There will always be numerous variables outside your control while traveling. Make a point of controlling that which you can – your productivity. Being productive while traveling is all about sticking to your good work habits so you can work effectively and efficiently in any environment, in any time zone. by sticking to your good work habits.